I have been working super hard lately on new designs and tweaking older designs. I have a craft fair coming up in September, plus I want to be prepared for the holiday season. I am super happy with the colorways this time around and how clean my molds came out. It was actually the best batch I’ve EVER done! I hardly had to clean edges or sand down spills. Seriously PERFECT! I’m so thankful for this too, since a lot of my newest designs require things to fit together and be the same thickness. I’m not prepared to share those just yet though. I kinda want to share them as finished pieces. For now though I can share my newly re-designed arrow necklaces!! They are much smoother, shinier and slightly thicker. The super smooth mold made it so I could do clear and semi opaque colorways, and even mixed pieces!! I can’t wait to add these to the shop! Keep an eye out for all my other new pieces. I’ll be adding them to my Etsy shop in batches throughout the month! I received the sweetest package from my friend Norah about a week and a half ago, a box of Mold-A-Rama’s and a bunch of stickers and T-shirts for CT! She had read one of my thrift finds post back in July where I talked briefly about how much I loved one of my Mickey toys because they looked so much like Mold-A-Rama souvenirs. I had offered to trade jewelry for any pieces someone was willing to send me. Well Norah didn’t just send me one, she sent me FOUR! Wasn’t that nice of her? All are from the Brookfield Zoo in Brookfield, IL. They are so neat! Even after being in the box, and wrapped separately, they still have the melted plastic smell as if they just came out of the machine!! The main character in the show, Jaye, works at a souvenir shop next to Niagara Falls. 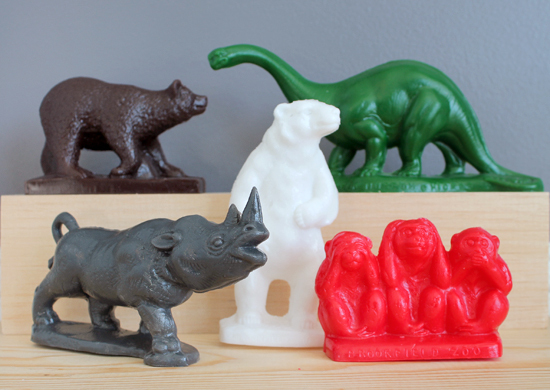 In the shop they have a Mold-A-Rama that makes, what they call, wax lions. In the first episode someone tries to buy one of the lions, but the mold malfunctions and the lion is missing part of its head. The person returns the lion and for some reason Jaye keeps it. Pretty soon the lion starts talking to her, and telling her to do things she doesn’t want to do. That’s pretty much what the show is about, inanimate objects talk to her and tell her to do things, usually good things. The lion, with its missing head, is pretty much throughout the entire show. I loved that thing. Before the show I had no idea machines like that existed! I grew up in between DC and Baltimore. Both cities are filled with tourist sites and souvenir shops, but I had never seen anything like a Mold-A-Rama machine. I looked them up and saw there’s hardly any close by. I gave up on the idea for awhile since I didn’t think I’d be travelling to any of those locations anytime soon. Well, about four years ago I had the pleasure of finally visiting Chicago. I was sharing a booth at Renegade Craft Fair and staying with my friend Leigh for the week. I had a lot of time to wander the city during the day while she worked. One of the days I visited the Field Museum, which by the way is awesome! As I was wandering the basement I found a Mold-A-Rama machine!! A real one, in person! I can only imagine how excited I looked. I may have even looked crazy. It was so neat to watch the machine make the green Apatosaurus (pictured above). It’s a metal mold that they pour hot plastic into and then inject air to form it perfectly. I make molds and pour plastic all the time, of course this was the coolest thing ever for me! 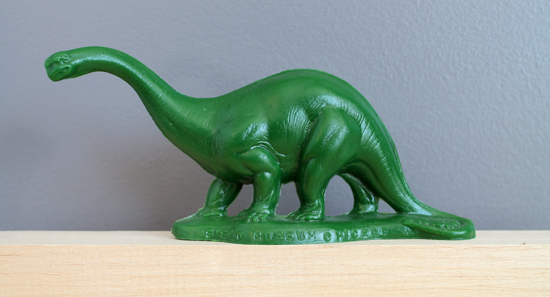 I bought a bunch of souvenirs that trip, but this green dinosaur was seriously my favorite piece. I packed it super careful in my luggage, was super careful unpacking it and put it right on the shelf when I got home. All for something that cost about $2! So here is my collection so far. Five Pieces, all from the state of Illinois. I’m so happy to have them! Thank you again Norah!! You RULE! I am itching to get more though, and am cross checking my list of awesome friends and the cities they live in with the list of Mold-A-Rama locations. Haha, not really. I am going to print out that list though, and keep it in my suitcase. Who knows, maybe I’ll see a machine in person again someday. Oh and something else neat real quick. Rotofugi in Chicago, IL now has a refurbished machine that makes Helper Dragons by Tim Biskup. I missed out on the orange one, but I was able to snag a wine colored piece. I’ll share photos when it comes in. P.S. : the offer to trade jewelry (or accessories) for Mold-A-Rama pieces still stands. Please don’t go out of your way, but if you happen to see one and want to watch it being made, I’d love to trade for a finished piece!! We had a much different weekend than the last one, It was jammed pack with family and work. I hardly sat down. I was planning on doing a full on post this morning, but I have a friend and her adorable little boy headed over soon for a play date, plus I have a doctors appointment right afterwards. The post can wait until tomorrow. For now I will leave you with an Instagram photo I took of the work I finished this weekend. I feel very accomplished. I’m really excited about the colors I produced, they are a lot calmer. Plus if you look closely you’ll see there is some new designs in there that haven’t been updated on the site yet. I’m hoping to work on that this week!! How was your weekend? Did you get anything done?